Lately I have started putting more efforts towards my fitness, and hence am using the Goqii band, joined Zumba and try to keep my diet healthy. 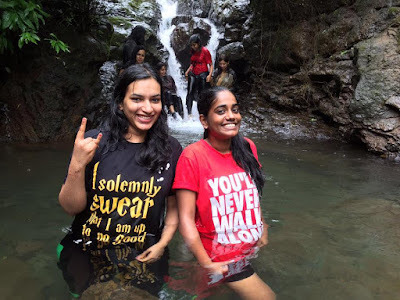 When my friends/colleagues told me about taking a Trek, I was hesitant at first because I have never been on a proper trek in ages, the last one probably being a easy one during my college days. But the description of the place was full of mystique and I knew I could do with some 'me-time' and challenge myself, so I signed myself up with Global Journeys. 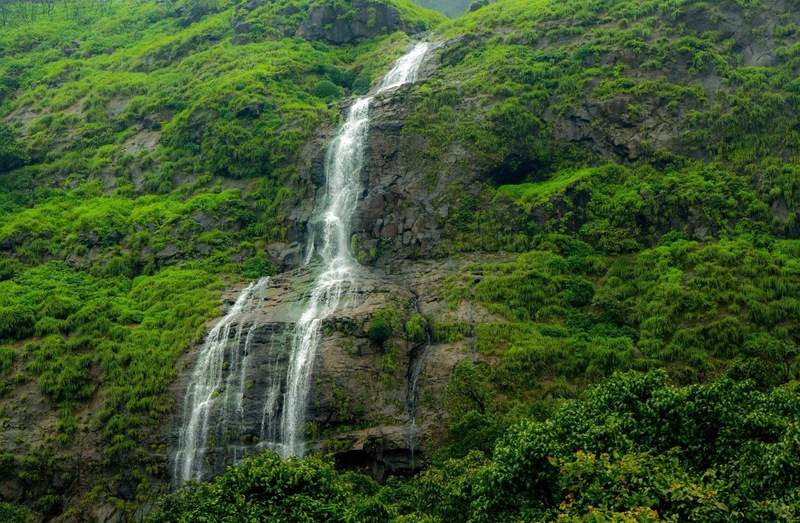 Andharban or The Dark Forest is located in Pimpri, nested amongst the Sahyadris. 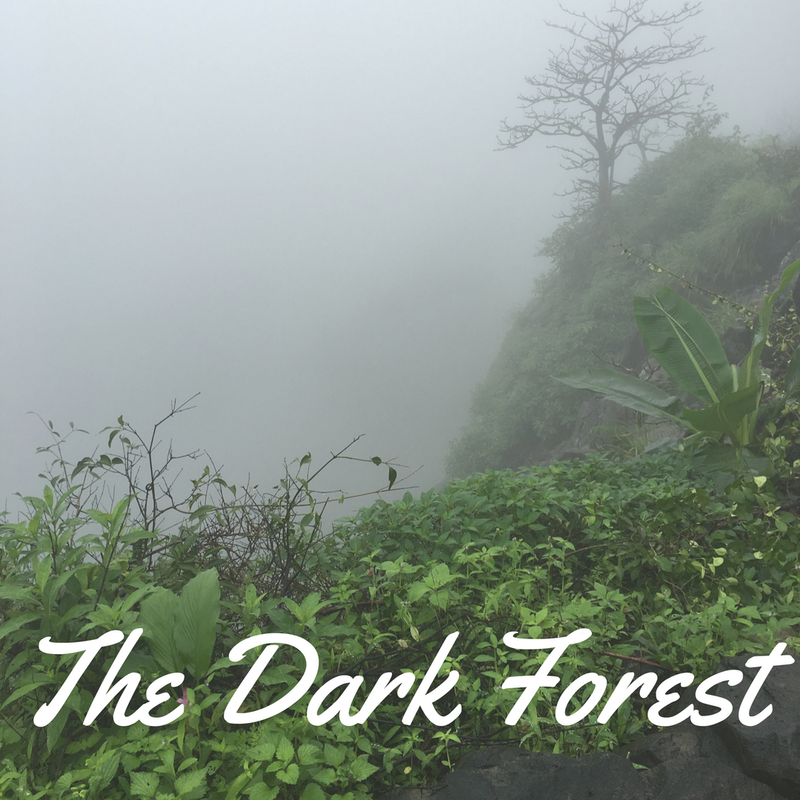 It took us around 4+ hours from Navi Mumbai to reach the starting point. 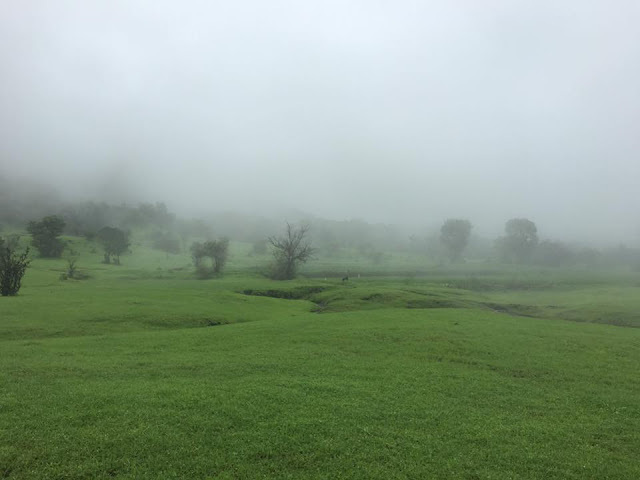 Everywhere you turn, all you can see is lush greenery and misty dew and fog! I almost wished we could just camp there and chill, but there was a lot more in store for us. The trek was a path that ascended and descended, sometimes in the open, sometimes at the edge of a cliff and sometimes amidst the darkness of the jungle. We had to concentrate on where we're treading because there were slippery stones with moss growing or there was mushy trails, but every now and then we looked up to admire nature at it's best. Imagine a scene out of a movie like Mowgli or think of the Amazon Rainforests, that's how it felt. 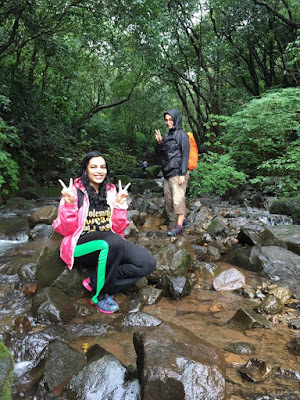 I was under the misconception that it was going to be a easy-peasey walk, but it required your you to keep your senses alert and balance well and be fast or you would loose the group and the trail. We took a break half-way near a waterfall where we enjoyed the chilly water and then ate our packed lunch - sandwiches etc provided by the team. Rested, we started hiking again and reached the end point which again had waterfalls. Words or pictures cannot describe the scenes we saw with our eyes, it was surreal and Godly! One phrase to describe it would be 'Hauntingly Beautiful'.. mesmerising, but loose your balance at the wrong place and fall, you definitely feel the adrenaline rush pumping specially near the cliff's edge. But once you overcome your fear, achieve what you doubted if you could, there is such a high in that feeling! The way back, we were all much more confident because by now we had understood where to step, how to go about tricky areas. Even though the rain had increased and we were drenched, we went back to our starting point in one shot, without any breaks. We were so happy to make it back and just couldn't wait to change out of the drenched clothes. I did finally fall towards the end and hit my hand on a stone, but fortunately nothing major. 1) Wincheater/Poncho (After all, you cannot really hold an umbrella and trek). Though you will still get drenched at the end, you can save a little and maybe keep your bag protected too. 2) Really good gripped running shoes/trekking shoes (You might not want to invest in shoes made for trekking unless you plan to go frequently, but good quality running shoes should be good enough.) Quick Tip - Make sure you've worn the shoes before and are comfortable in them, otherwise there is always a chance of shoe-bites and discomfort. What I personally did is carrie dan extra pair in my bag, just in case. Carrying that was better than the thought of being barefoot if it came to that. 3) Water & Energy Drinks to hydrate yourself. Even though you're drenched in the rain and have swallowed some natural water in the process, you need to carry water with you. I also carried Gatorade. 4) Change of Clothes, Towel and extra footwear for once you're back, for you don't want to travel back to the city in your wet garments and catch a cold. We got to change inside a villager's hut and then had some nice hot tea and bhajiya in a nearby stall too. Pure bliss! 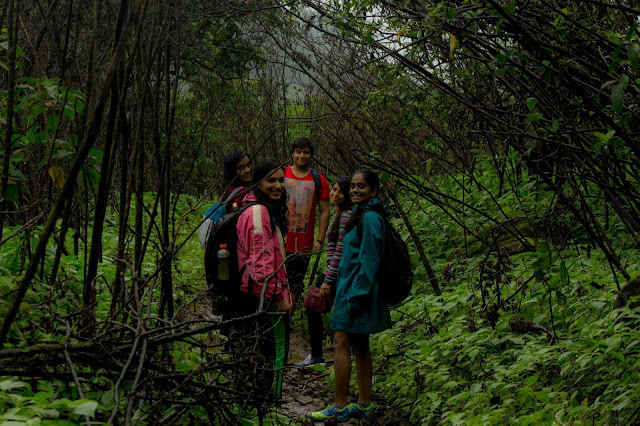 5) The trek organisers usually carry first aid, but if you have some personal medicines, don't forget to carry that. Also carry some snacks like biscuits, apple or protein bar incase you don't like the lunchbox given. 6) Most importantly, trust your instincts, have a good stamina and determination and learn to balance. That is what will help you the most in your journey. The monsoon season for the year will end this month, so if you still want to make the most of it, book now! Global Journeys has a few more treks planned, you can check them out here. P.S. All pictures are original, taken by us during this trek. They're wallpaper worthy for sure! I am taking my Alexa Rank to the next level with Blogchatter. You can follow the journey with the #MyFriendAlexa and #JillOfAllTrades. Hey this place looks so dreamy!